Are you farming along with Lori of Bee in my Bonnet? I am and I am LOVING it! She is showing us 2 blocks each Friday. 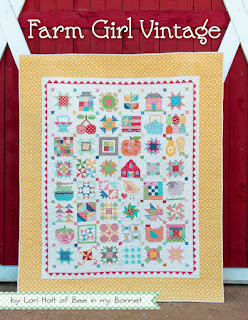 My plan is to make 2 quilts as we go along (or maybe more if I get super excited). I am going to make the sampler from the front of the book with 6 inch blocks. And I am also going to make the Haystack quilt which calls for (13) 12-inch blocks along with a ton of little haystacks blocks. Super cute, love the little farm animals in the Autumn star, they made me giggle. trying to be patient, but I can not wait to get my book! I love your blocks! I am making the 6 inch blocks from my scraps. This is such a fun sew along. Adorable blocks!!! It is killing me not having time to join this bee! !